Welcome To Mr. G.'s Website! Civics & American History ROCKS!!! Civics is the study of citizenship and government. 7th Grade Students will be studying the U.S. Constitution and how it affects them in their everyday lives in the United States of America. 6th & 8th Grade American History Students will be studying American History from the discovery of North America through Reconstruction (after the Civil War). We will be learning about Geography, Democracy, Current Events, Core Values, and analyzing Primary and Secondary Resources. We will also discuss how the UNITED STATES is a nation of the people, by the people, and for the people. Be a good citizen everyday! Thank you for checking out Mr. G.'s Website! I'm just a BILL. 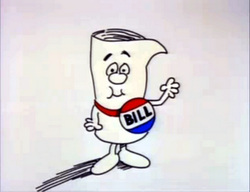 A bill is an idea for a law.